The broken leg felt round the country — during college basketball’s showcase event — left teammates and coaches in tears and television networks turning away from video of the gruesome injury. It also inflamed the debate about the treatment and care of unpaid college athletes who help generate hundreds of millions of dollars for their universities. Ware, arriving in Atlanta with the team, will not incur out-of-pocket expenses for his rehabilitation while he is in school. 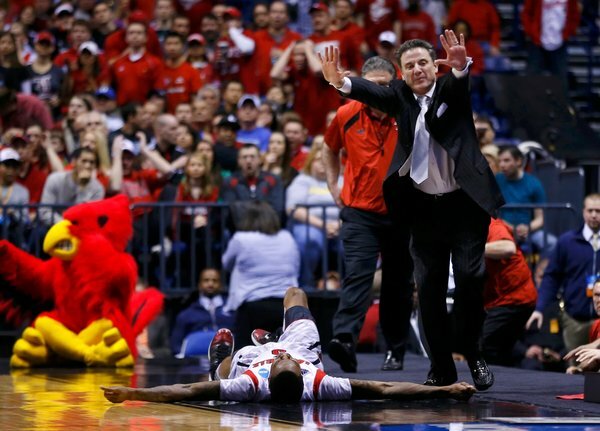 The injured player was Kevin Ware, a sophomore guard for Louisville, playing in the N.C.A.A. tournament. He was taken to a hospital and had surgery to repair compound fractures of his tibia. Louisville officials said the university had a secondary policy on its varsity athletes, ensuring that Ware, who also has his family’s primary insurance, will incur no out-of-pocket expenses in his rehabilitation. But Ware is likely to be personally responsible for any health care expenses related to the injury after he leaves Louisville. Injuries sustained in college athletics that linger or develop into chronic conditions are generally not covered by a university’s or the N.C.A.A.’s medical insurance once an athlete has left college. Louisville officials declined to specify the terms of the policy that covers Ware or to say who would handle his medical bills if the injury led to problems later, after he left the university. The N.C.A.A. said it was not able to comment on a specific athlete’s medical condition. Bob DeMars, who played four years as a defensive lineman for Southern California, from 1998 to 2001, tore the posterior cruciate ligament in each knee while playing for the Trojans. He also sustained a serious neck injury and separated both shoulders. “I wake up with a lot of things bothering me sometimes, and my knees are unstable,” said DeMars, 33, a filmmaker and part-time teacher. “If my knee goes out because I don’t have a P.C.L. and my anterior cruciate ligament tears and I’m hobbled for the rest of my life, I hope Southern Cal helps me pick up the pieces. But they don’t have to. If Ware’s medical claims exceed $90,000, he will also qualify for the N.C.A.A.’s catastrophic insurance program, which has some continuing coverage under certain conditions. The N.C.A.A. has additional supplemental insurance for injuries that occur during championships events. But not all colleges generate as much revenue through athletics as Louisville does; the university took in more than $40 million through its basketball program alone last year. Many colleges outside the N.C.A.A.’s top athletic tier do not offer comprehensive secondary policies to their varsity athletes. The N.C.A.A. requires an institution only to certify that each athlete has some kind of primary medical insurance, which is usually a family policy. “And if an athlete’s parents don’t have a policy, then the college offers them the same policy they offer regular students,” said David Dranove, a health economist and a professor at Northwestern University’s Kellogg School of Management. “That is usually a group policy that’s not particularly generous and not tailored to the kinds of injuries that occur in sports, which often require specialized surgeries, long rehabilitations and expensive tests” like magnetic resonance imaging tests. American labor law created decades ago established that workers exposed to injuries in the normal course of their jobs should not be expected to pay because of those injuries, Dranove said. “The N.C.A.A. is 100 years behind the rest of the country,” he said. Even at top-tier institutions — as well as at the hundreds of medium-size and small colleges that have sports programs — secondary insurance policies can have significant coverage gaps. In addition, not many injuries are serious enough to reach the $90,000 deductible that triggers the N.C.A.A.-sponsored policy. Valerie Hardrick, whose son Kyle was a basketball player at Oklahoma, was stunned to discover she owed $10,000 for an M.R.I. and other tests performed on her son when he injured his knee in 2010. Her private insurance paid for about $20,000 in other medical bills, but the M.R.I. was classified as an out-of-pocket expense. Hardrick did not get the bill for the M.R.I. until nearly a year later, after Kyle’s scholarship was not renewed, Hardrick told a Congressional panel on college athletics in 2011. Bob DeMars, a former defensive lineman for U.S.C., hopes the university will help him pay for his troubled knees. Concerns about inequitable treatment of college athletes last year caused the California Legislature to pass a bill known as the Student-Athlete Bill of Rights. It requires universities that generate more than $10 million in annual media revenues from athletics — four California universities qualified immediately — to provide equivalent academic scholarships to varsity athletes who are injured and lose their athletic scholarships. It also mandates that the institutions pay the health care premiums for low-income athletes and cover all deductibles for injuries related to participation in an intercollegiate sport. The vast majority of high-level athletes are on yearly scholarships that are renewable at the discretion of the institution, and complicated and onerous N.C.A.A. restrictions on outside jobs and private contributions often put varsity athletes at a financial disadvantage compared with the rest of the student body. As a result, the pressure on the N.C.A.A. to alter its policies substantially is growing. Ware’s injury has heightened the focus on another issue:health insurance coverage. As for Ware, with his broken leg in a cast, he is expected to attend Louisville’s game Saturday in the N.C.A.A. tournament’s Final Four, an annual highlight on the American sports calendar.